Recombinant fragment within Human CD4 aa 200-400. The exact sequence is proprietary. WB: THP-1 and HuT-78 cell lysates, human fetal thymus, tonsil and lymph node tissue lysates. IHC-P: Human tonsil, liver, spleen, thymoma and colon tissues. ICC/IF: Jurkat cells. Flow Cyt: Human peripheral blood lymphocytes. Our Abpromise guarantee covers the use of ab133616 in the following tested applications. WB 1/5000. Detects a band of approximately 51 kDa (predicted molecular weight: 51 kDa). Immunohistochemistry (Formalin/PFA-fixed paraffin-embedded sections) analysis of human tonsil tissue labelling CD4 with purified ab133616 at 1/500. Heat mediated antigen retrieval was performed using Tris/EDTA buffer pH 9. ab97051, a HRP-conjugated goat anti-rabbit IgG (H+L) was used as the secondary antibody (1/500). Negative control using PBS instead of primary antibody. Counterstained with hematoxylin. Human peripheral blood lymphocytes stained with unpurified ab133616 (red line). Human whole blood was processed using a modified protocol based on Chow et al, 2005 (PMID: 16080188). In brief, human whole blood was fixed in 4% formaldehyde (methanol-free) for 10 min at 22°C. Red blood cells were then lyzed by the addition of Triton X-100 (final concentration - 0.1%) for 15 min at 37°C. For experimentation, cells were treated with 50% methanol (-20°C) for 15 min at 4°C. Cells were then incubated with the antibody (unpurified ab133616, 1/100 dilution) for 30 min at 4°C. The secondary antibody used was Alexa Fluor® 488 goat anti-rabbit IgG (H&L) (ab150077) at 1/2000 dilution for 30 min at 4°C. Isotype control antibody (black line) was rabbit IgG (monoclonal) (0.1μg/1x106 cells) used under the same conditions. Unlabelled sample (blue line) was also used as a control. Acquisition of >30,000 total events were collected using a 20mW Argon ion laser (488nm) and 525/30 bandpass filter. Gating strategy - peripheral blood lymphocytes. Immunohistochemistry (Formalin/PFA-fixed paraffin-embedded sections) analysis of human thymoma tissue labelling CD4 with purified ab133616 at 1/500. Heat mediated antigen retrieval was performed using Tris/EDTA buffer pH 9. ab97051, a HRP-conjugated goat anti-rabbit IgG (H+L) was used as the secondary antibody (1/500). Negative control using PBS instead of primary antibody. Counterstained with hematoxylin. Immunohistochemistry (Formalin/PFA-fixed paraffin-embedded sections) analysis of human colon tissue labelling CD4 with ab133616 at a dilution of 1/100. Immunohistochemistry (Formalin/PFA-fixed paraffin-embedded sections) analysis of human tonsil tissue labelling CD4 with ab133616 at a dilution of 1:500. Heat mediated antigen retrieval was performed using AR9 antigen retrieval solution, and microwave treatment for 15 min at 20% power. Anti-Rabbit/Mouse HRP polymer (PerkinElmer Opal Polymer HRP Ms Plus Rb) was used as secondary antibody. Opal tyramide amplification was performed using Opal 520 fluorophore. Counterstained with DAPI stain. Image scanned with Vectra 3.0 and analyzed via Phenochart software. Immunohistochemistry (Formalin/PFA-fixed paraffin-embedded sections) - Anti-CD4 antibody [EPR6855] (ab133616)This image is courtesy of an anonymous Abreview. 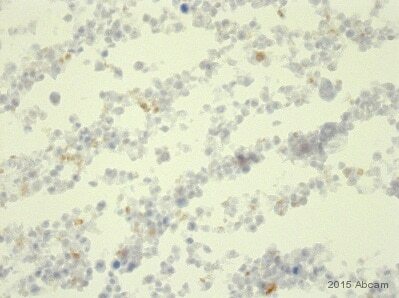 Paraffin-embedded human spleen tissue stained for CD4 using ab133616 at 1/500 dilution in immunohistochemical analysis. Immunohistochemistry (Formalin/PFA-fixed paraffin-embedded sections) analysis of human tonsil tissue labelling CD4 with unpurified ab133616 at a dilution of 1/100. 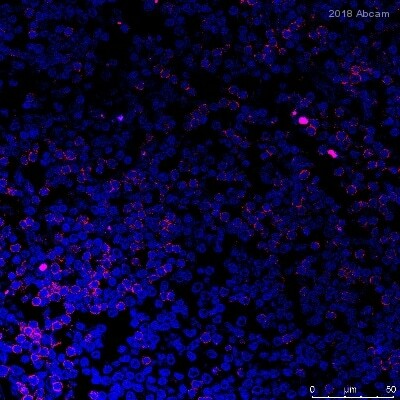 Immunohistochemistry (Formalin/PFA-fixed paraffin-embedded sections) analysis of human liver tissue labelling CD4 with unpurified ab133616. Immunohistochemistry (Formalin/PFA-fixed paraffin-embedded sections) analysis of human spleen tissue labelling CD4 with unpurified ab133616. Immunohistochemistry (Formalin/PFA-fixed paraffin-embedded sections) analysis of human thymoma tissue labelling CD4 with unpurified ab133616. Negative control: no staining on human cerebrum. Immunohistochemistry (Formalin/PFA-fixed paraffin-embedded sections) analysis of human cerebrum showing no staining CD4 with purified ab133616 at 1/100. Heat mediated antigen retrieval was performed using Tris/EDTA buffer pH 9 (ab93684). Goat Anti-Rabbit IgG H&L (HRP) was used as the secondary antibody. Counterstained with hematoxylin. 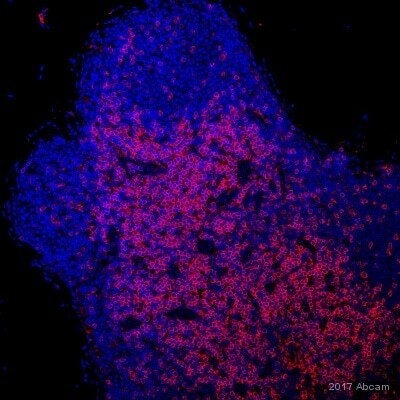 Negative control: no staining on human pancreas. Immunohistochemistry (Formalin/PFA-fixed paraffin-embedded sections) analysis of human pancreas showing no staining CD4 with purified ab133616 at 1/100. Heat mediated antigen retrieval was performed using Tris/EDTA buffer pH 9 (ab93684). 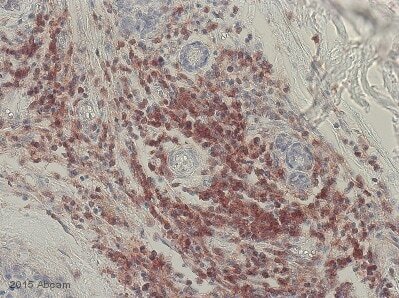 Goat Anti-Rabbit IgG H&L (HRP) was used as the secondary antibody. Counterstained with hematoxylin.